I found this healthy recipe on kitchen many years ago and bookmarked it. But sadly I tried it on my own only recently. What held me back for so long is that I expected a taste compromise I didn’t want. I must admit I was blown away by the intense taste and creamy consistency of this one-ingredient ice cream. You need a powerful blender or food processor that can ideally mix at low rpm. Not every high-power mixer can do this! Depending on the shape of your mixer’s container, different minimum quantities are required for the nice cream preparation. The Vitamix TNC 5200, the Vitamix Creations or the Thermomix (that’s what I’m using) can produce small amounts of ice starting at 250 ml, the Bianco Primo starts for example at 500 ml. Once the fruit coins are frozen, puree them in a blender or food processor: In the first blending round the frozen banana pieces look a bit chunky and crumbled. Then with each new blending session, they change their texture. Don’t forget to scrape down the sides. First, it gets pasty like mush. Keep blending! Then slowly the mush gets smoother and suddenly it changes to a creamy consistency. But pay attention, if you have a powerful food processor like I have you could easily “over blend” it. So best is to process in short sessions on medium speed and check in between. To aerate the ice cream blend for a few more seconds more. You can make of course a larger batch with 2 or 3 bananas. But please make sure your food processor is big enough. Are bananas high in fiber? 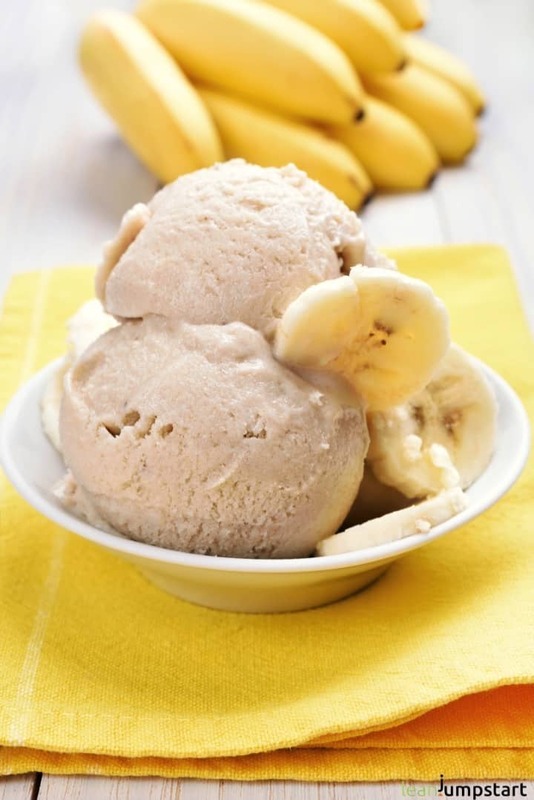 Maybe you assumed that a pureed frozen banana would be icy or flaky like other frozen fruits. 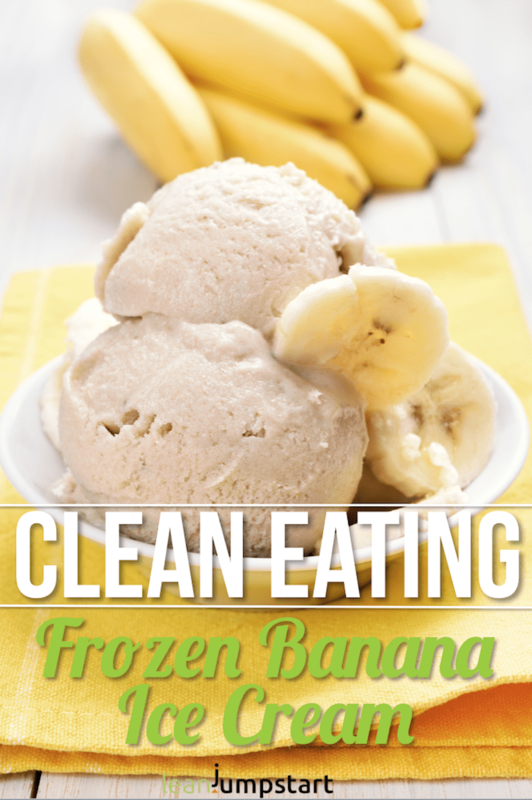 Why does frozen banana change into a creamy consistency when blending? The reason for this is its high content of pectin, which is a soluble dietary fiber. Pectin is often used as a gelling agent in the industry. The high pectin content is also the reason why this tropical fruit is often used as a natural remedy against diarrhea. Pectin binds superfluous water and firms the stool. In the banana ice cream case, it binds the superfluous ice water. So now as you know the magic behind it, before trying it let me share with you one last thing – my quick step-by-step video. It is almost like magic! The most important success factor is to use at least ripe bananas. They have yellow skin with small brown dots, without any green color. Surprisingly even better work overripe, soft fruits. You know, those with black skin (Yuck!) you wished you had eaten some days before. If you are like me you have not always the time or mood to bake banana bread from overripe bananas. Especially on hot summer days, I omit to use my baking oven. Before your overripe fruits end up in the organic waste now you have a better option. Try this simple one-ingredient ice cream recipe instead or use your black skin banana for my best ever strawberry banana smoothie. Isn’t this a fantastic homemade dessert recipe, especially in the summertime? Sugar-free, dairy-free, vegan, gluten-free, fat-free, rich in fiber, clean…let us know your experience with one-ingredient ice cream in the comment section below. How did you like it? Although this nice cream has significantly fewer calories than regular ice cream, you should not go overboard here either. Compared to other fruits, bananas contain many carbohydrates (22.84 g per 100 g). On the other hand, they are great sources of energy and really make you full. Just keep that in mind a little bit when indulging, but don’t get crazy about it. Do you love clean eating treats with just a few ingredients? For a delicious and healthy recipe, there is really no need for a long ingredient list. In doubt, less is more and quality beats quantity, especially if weight loss is your goal. This philosophy is also the base of my 52 Chef Habits Course where I teach you how to simplify your clean eating habits to get in shape. Click through to learn more! This is just the basic recipe. Of course, you can always vary it according to your taste. The sky is the limit. Milk: You might want to try plant-based drinks like almond milk, coconut milk or soy milk. For vegetarians: dairy milk works too. Fruits: Especially berries or other fruits such as mango, pineapple or kiwi are amazing variations. Spices: You can also experiment with different spices, such as cinnamon and vanilla, or create a chocolaty version with cocoa nibs and raw cocoa powder. Nuts: Consider adding peanuts, almonds or walnuts. Peanut butter is another amazing add-on and worth a try. But again, if weight loss is your goal, use nuts and nut butter wisely. Wow – it’s hard to beat a one-ingredient cool treat with a texture like that! This is such a good idea and perfect for this heat! This has been a favorite of ours for years. You photos and video are great! Thank you for your compliment Amanda. You are lucky that you know this simple recipe since many years, I wish I knew it much earlier too. Thanks for these great instructions. I didn’t know that about the pectin – how interesting! You are very welcome Helen:) Yes, without pectin – the miracle fiber in bananas – you could not create nice cream. This is such an easy and delicious summer treat! And only 1 ingredient! Win-win!